The term generally does not cover organisms whose genetic makeup has been altered by conventional cross breeding or by “mutagenesis” breeding, as these methods predate the discovery of the recombinant DNA techniques. Technically speaking, however, such techniques are, by definition, genetic modification. Examples of GMOs are diverse, and include transgenic experimental animals such as mice, several fish species, transgenic plants, or various microscopic organisms altered for the purposes of genetic research or for the production of pharmaceuticals. Transgenic animals are frequently created by two different techniques: microinjection of DNA into the pronucleus of zygotes and injection of embryonic stem cells into blastocysts. The procedure is done with the help of a complete microinjection set-containing of a microscope, micromanipulators, microinjectors and micropipettes. The first GMO was created in 1973 by Stanley N. Cohen and Herbert Boyer, demonstrating the creation of a functional organism that combined and replicated genetic information from different species. In mid-1974, very soon after the first GMO was created, scientists called for and observed a voluntary moratorium on certain recombinant DNA experiments. One goal of the moratorium was to provide time for a conference that would evaluate the state of the new technology and the risks, if any, associated with it. That conference concluded that recombinant DNA research should proceed but under strict guidelines. Such guidelines were subsequently promulgated by the National Institutes of Health in the United States and by comparable bodies in other countries. These guidelines form the basis upon which GMOs are regulated to this day. Like bacteria and plants, animals can be genetically modified by viral infection. However, the genetic modification occurs only in those cells that become infected, and in most cases these cells are eventually eliminated by the immune system. In some cases it is possible to use the gene-transferring ability of viruses for gene therapy, i.e. to correct diseases caused by a defective gene by supplying a normal copy of the gene. 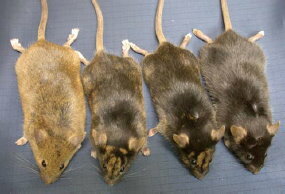 Permanent genetic modification of entire animals can be accomplished in mice. The process begins by first genetically modifying a mouse embryonic stem cell. This is normally done by physically introducing into the cell a plasmid that can integrate into the genome by a process known as transfection. During transfection the DNA integrates into the animal genome via non-homologous recombination. This altered cell is implanted into a blastocyst (an early embryo), which is then implanted into the uterus of a female mouse. A pup born from this blastocyst will be a chimera containing some cells derived from the unmodified cells of the blastocyst and some derived from the modified stem cell. By selecting mice whose germ cells (sperm- or egg-producing cells) developed from the modified cell and interbreeding them, pups that contain the genetic modification in all of their cells will be born. Baylor College of Medicine currently has one of the largest transgenic mice facilities in the country. There has also been the genetically manipulated bull Herman with 55 offspring. A human gene was built into his genetic code while in an early embryonic stage in 1990. As a result, milk from his female descendants contained the human protein lactoferrine, which can be used as medicine, but it was present at such low levels that it was not profitable to extract them.